Blue sky could be seen through the clouds as riders arrived for the first instalment of a brand new trophy race. By race start – thirty five riders had signed on for The Goldfinch. Riders were racing to win the medal in honour of Lois and Bill Goldfinch whom are well known throughout the Victorian veteran cycling community. 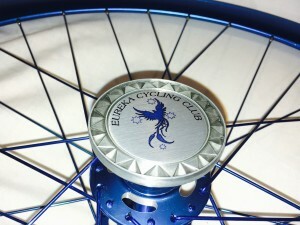 Also, the winner of the race would be the first inscribed on the Blue Wheel Trophy – the perpetual trophy for the event. This trophy race will be renamed each year in honour of stalwarts of our club who ensure that we race each and every week. Their dedication to our members and club is part of the Eureka fabric which others aspire to. What better way to start a new trophy race and acknowledge Lois and Bill who have been at the club since day one? Thirty five riders! Enough said! A most interesting Limit bunch set off with the healthy mark of 30 minutes. Club President – John Faulkner – had found his mojo and his bike in the same corner of the garage. Faulk’s day amounted to pretty much a solo time trial and somehow he missed riding up the big hill – oh well, next year! Six riders rode off 17 minutes as the Second Limit group. Handicapper – Peter Livitsanis – has steadily elevated himself out in the marks this year. This isn’t so much to give himself a time advantage, as to ensure he is surrounded by big bodies. Fellow shorty – Roger McMillan – was using this race as his final hit out for the Geelong Open next weekend. 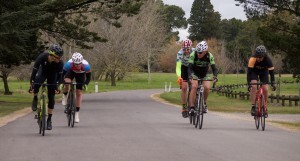 Roll turns with the group and smash the hill to smithereens…was how Rog mentally prepared himself. The reality may have been somewhat different, however he heads to Paraparap next week full of confidence. Phil McLennan still does crazy running sports on Saturdays before coming out and racing on Sundays. With the high early pace in the race, Phil’s day lasted longer than he originally expected. Those final climbs were enough to finally unhitch him from his bunch. James Gretton rode out of his skin today to win the sprint finish for about 30th place. Usually our races approach the Harrison’s Road climb from the south and time and time again, “Ralph” somehow gets lost on the course and doesn’t make it to the big hill. No fear this time, as Ralph did plenty of the power work for his group, before ultimately capitulating on the lower slopes of the Harrison’s Road climb. Once over the top he found his rhythm again and was a force to be reckoned with on the home straight. Rob Parker has been carefully selecting his events this year. 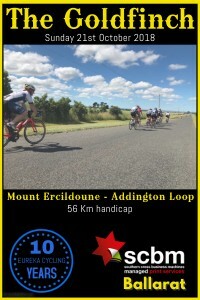 Back in the autumn he identified the parcours of the Ercildioune-Addington Loop as suiting his talents and spent winter preparing for his assault on the race. 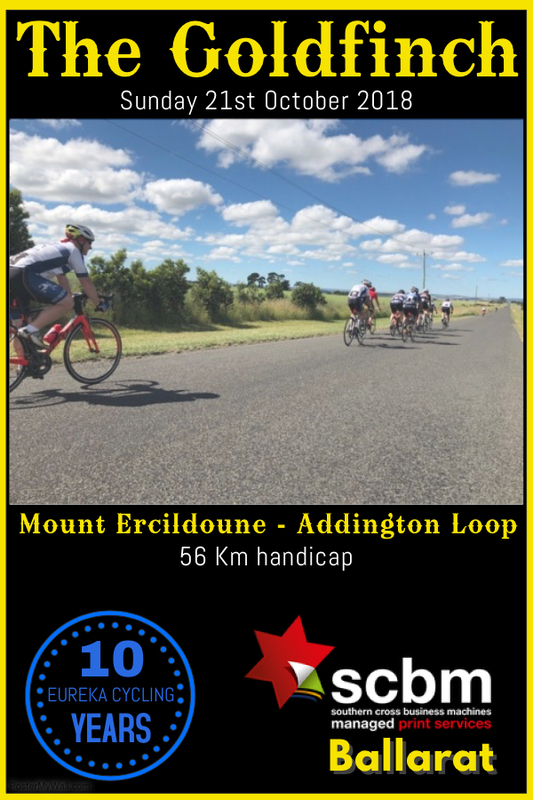 New club member Cameron Farrington has already graced the criterium circuit this spring and shown that he has a pretty handy motor. He will be happy in the knowledge that our circuits don’t get much tougher than this one…well they do…just don’t tell him. There was a rort going on in the 13 minute group today. Third Limit containing the likes of Mick Veal who normally rides off 9 minutes in Open events?! Well we wouldn’t have believed it, but the doc must have worked some voodoo magic to get a place in this bunch. None of his cohorts were complaining. In fact they liked the change up…Livitsanis OUT, Veal IN. Danny Whelan was back after his version of tapering the previous weekend. The Hill likes Dan and Dan likes the Hill. Actually, Dan just likes inflicting pain. Noel Said was satisfied that winter had finally broken in Ballarat. After holidaying in sunny Europe during the colder Australian months, Noel was back and ready to rumble. This sort of course suits his style of riding. Unfortunately for everyone in Third Limit, Noel’s small physique provides the worst sit in Victorian veterans racing. Bob Morley was looking trim and ready to rumble today. Trading barbs at the start line, “Muncher” was also gathering his troops for the battle ahead. Confident in his ability to hang on when the going gets tough, Muncher just needed to make sure the bunch didn’t implode too early. The final member of the group was Greg Nunn. Another rider who in a smaller field would find himself back a bunch. Quiet confidence about Nunny today who was much less chatty than usual on the start line. He was rating himself a big chance and so were we. The middle bunch was the largest group of the day with eight riders all told and some pretty big hitters. From here back to Scratch, the rider numbers would drop by two in each group. Would the numerical advantage make all the difference? 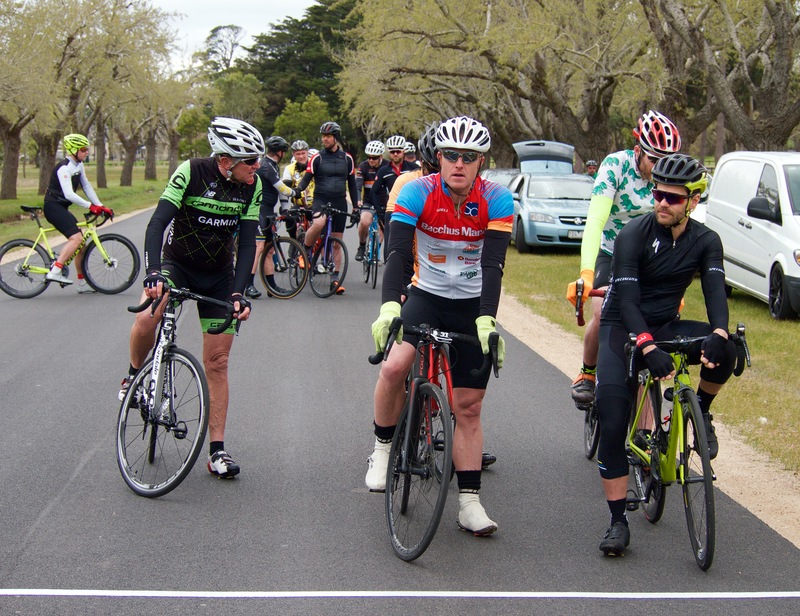 Another factor that could have a say in the proceedings, was that half of the riders from the middle to Scratch had competed the previous day in a fast and furious race with Ballarat Sebastopol CC – on a short, but challenging circuit. Ash Burke must have been wondering if he had offended the Handicapper to find himself in this bunch. Ash’s plan was to hang on for as long as possible, then hang on some more. He was honoured to be placed in this company, but dang it was going to be a fast ride! Richard Taylor was up from Bacchus Marsh for a rare race. Even when he isn’t race fit, Rich still puts in a huge effort. There would be no sitting on by this bloke! Brian Ure was pleased to find himself somewhat elevated in the rankings. Eventually his ability to race hard was going to be noticed and this was that day. His “Froome like frame” was deceptive as the hills were somewhat less to his liking. Take him to a sprint finish at your peril. Rick Calvert barely registered Harrison’s Road as a blip. Climbing Mont Ventoux THREE times in the ONE day tends to give a rider a different perspective on climbing. As long as he could hold pace with the bunch, he was more than ready to go ballistic on the Hill. Jeremy Humber was happy with the large entries for the race. The slight push out would certainly work in his favour. Managing his effort on the climb would be the key to his race. Jim Crumpler is breathing rare air in the outer groups of recent at both cycling clubs. Still recovering from a nasty head crunching fall a few weeks earlier, those crazy long touring rides he did over winter are helping serve riders who normally wouldn’t get the privilege of seeing “Lever” in action. Peter Canny was certainly happy to have Lever in his bunch. Having sat on him for 8/9 of a 45 Km race the previous day, Canny was more than prepared to do it again in a longer race. Third Scratch rode off at 5 minutes. Five big bodied engines and one nimble climber made up this group. Early stages and the group rolled turns. Not always fluently, however it was more than efficient enough to steal some seconds off the groups ahead and open a gap on Second Scratch. Losing Birch (flat tyre) before halfway did not help their chase. Matt Ayres rode above and beyond today for the group’s glory. Expecting to fail on the Hill, Ayres planned to do as much of the work as possible in the earlier stages before handing over to the climbers on the hills. At every opportunity on the flat, he would power back to the front and provide another effort. Stuart Brien had raced the previous day, yet was comfortable when the rolling turns were smooth. Somehow he hung on all the way to the turn onto Harrisons Road. Off the bunch on the climb, he would perform some heroics on the few downhill sections for some glory on the day – see Strava. Jason Hendry seems to be going comfortably one moment, then struggling the next. Able to hang on when the roads turned upwards, Jason paced himself admirably and still had enough left in the tank for some late efforts. Peter Kiel swapped turns with the big bodies on the flat sections, then accepted much of the pacing responsibility when the roads turned up. Over the top of the Hill, Pete pushed hard and led many of the bigger riders (who had tagged on) downhill. Dean Wells was another to have raced the previous day – like Brien and Birch. Sore legs were forgotten as the roads turned up and some of the speed left the group. This was his territory and he rarely relinquished the pace making duties as the group edged closer and closer to the bunches ahead. Second Scratch were set one almighty task on this day! Four riders chasing larger bunches and three of them had raced the previous day. From the start they were a kilometre or two off the speed they needed to average. Maybe they could join forces with Scratch? Greg Ley had the freshest legs in the group. When the inevitable catch was made by Scratch (albeit much earlier than any of them had expected), Greg quickly went to work and matched it with the big guns. Craig Lee was carrying heavy legs and battled hard to maintain contact when they were caught. He lasted a long time, before being unhitched just before his “not so favourite” part of cycling – hill climbing. Tavis Baker struggled with the pace of the group after the catch was made. Tavis will be better suited to longer races in the coming weeks. Tony Mirabella made up the group of four and prepared himself as best he could for the onslaught that would be Scratch. They arrived, but this day the pace was too fast. Scratch had just two riders. 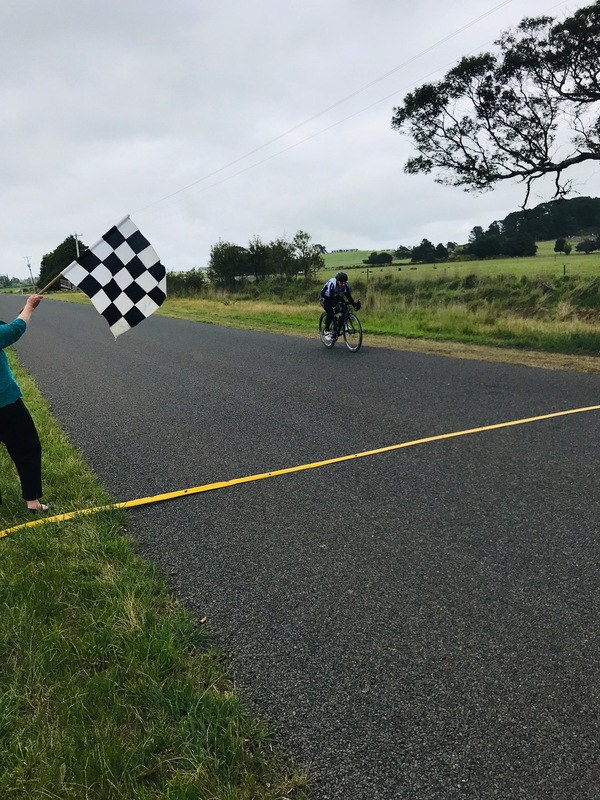 Club Champion – Tim Canny – was one rider, the other was a “trial” rider from Bacchus Marsh and boy weren’t the BM boys happy they had finally convinced this fellow to come up for a race? Shortly after entries had closed, Tim was found in the change rooms googling the palmares of the “new bloke”. Adrian McGregor had finally been coerced into venturing up to Learmonth to race with Eureka. “Don’t worry, they have at least one guy who can match it with you” the BM boys had suggested to help persuade Adrian. Canny and McGregor would prove to be a most superb weapon. Two young guns ready to tear each others legs off in pursuit of the front of the race. They had rounded up Second Scratch just a third of the way into the race. The next bunch would prove harder to catch. The climb up Harrisons Road gave them renewed vigor. Sure, Ley was still along for the ride at this point of the race, but it was a two man show and McGregor was especially happy to surge on the climbs. And so the race had made it’s way up Harrisons Road. Jakkii Dawson had some seven minutes on the chasers – at this point the race was Jak’s to lose. Most of the bunches had held together as they turned at Addington and started climbing towards the dreaded right hand turn. Once on that climb, the four steps served to shred riders from each group. Grant Dawson was in trouble early as he suffered a mechanical due to battery depletion – he was stuck in the big chain ring, but he still climbed that hill! Calvert found his climbing legs first and put a little gap on some of his group as he crested the hill. Racing across the Ercildoune skyline, rider after rider bridged the gap and a new chase bunch formed. Through Addington the second time and the race was both coming both together and fracturing even further. Jakkii was so far up the road that no one could see her. Still she pressed on though. It hurt and she combatted that by screwing her face even harder as she squeezed out every ounce of energy to clear the final climb up Edmonston Road. Over the top, finally! It’s virtually all downhill from here! The moment of respite that the downhill and flat section had provided for Calvert, Canny, Humber, Taylor, Morley, Nunn, Said, Livitsanis and others was being eroded by Wells, Kiel and Hendry. Then a new threat emerged as Canny, McGregor and Ley came flying past. Hendry latched on, the others held for a moment until McGregor went to the front on the rise near Harrisons Road and kicked in the afterburners. Scratch quickly closed on large group of chasers who were seemingly wallowing in comparison to the speed coming from behind. Scratch roared past and there was pandemonium in the bunch as riders turned themselves inside out to find the slipstream. Nunn was positioned well to latch onto the passing riders, Canny was not and he went off the tarmac to move up places and find Nunn’s wheel. For a moment it looked as though most of them would hang onto Scratch – and they did – for a moment – then the Scratch train roared off – just Canny and McGregor – the rest had been cast off. Over the final crest on Edmonston Road and Canny and McGregor could just see Jakkii ahead in the distance. Down to the sharp left turn onto Weatherboard Road and what is this?! A red flag! A red flag! A semi-trailer is slowly passing the intersection and Canny and McGregor’s charge is halted as they ease through the turn. Jakkii had made it through well before the truck arrived. The gap had opened again. The chase group had even closed in on the two Scratch riders who once again opened the throttle and gave chase. But ahead it is sweet glorious victory for Jakkii Dawson as she finds the finish line well clear of the chasers and takes a famous victory in front of a large crowd. Fifteen seconds later and Canny wins the race for Fastest Time and second place. McGregor was with him to the line. The large bunch in pursuit of the scraps spread across the road. Riders are eyeing each other off to see who would pull the trigger first. As one they launch. Hendry taking fourth place ahead of Nunn and a blur of riders filling the positions back to about 13th. Back at the club rooms and the extended Goldfinch family had arrived (after providing much of the crowd at the finish line) to join in the celebration of The Goldfinch race. The club rooms were quite full, the tables were loaded with food and the riders all shared similar stories about their race up the hills. Capping a fine day off, Bill Goldfinch drew Jakkii’s raffle ticket and she won a $200 bike service voucher courtesy of Orr & Co. Cycles. What a day for Jak! Small fields contested criteriums on the immaculate Victoria Park circuit. Just Division 1 and Division 2 competed in the windy conditions which made races very interesting! Division 1 saw new rider Ben Davies for a while, however he did not finish in what became a slugfest. Ben will be sure to atone in the next few weeks as he aims at the championship races we are staging. Peter Gunston was prominent early, however the experienced campaigners would have their day and unfortunately for Pete, he would not survive to the end. Sam Smith had earmarked this race a few weeks ago. He duly delivered, however it was no walk in the park as Stu Brien and Tony Mirabella were not planning on being easily despatched. Division 2 saw the return of Shane Cody in the largest field of the day. For those that don’t know, Shane is a former club champion. This is the first step in his return. Beware in the future…and don’t take him to a sprint finish when he is fit! Also back today was Richard Taylor. It is only a matter of time before Richard is back in Division 1 (read…next week). Ash Burke, Brian Ure, Michael Veal, Dan Crook and new rider (on his second trial) Cameron Farrington made up the field. At times there were attacks, at times there was pedestrian pace. No decisive break could be formed however and the race was always destined for a sprint finish – but which monster would mash the gears quickest? Brian Ure was the man today. Surely his continued dominance in the minor league has earned him at chance in the big league. Only time will tell, however we will have to wait until 2019 to see that card played by the handicapper . The threat of a shower or two did not deter 26 riders from taking their place in the first Points race the club has staged. The concept was born a few years ago when just four riders showed up for criteriums. 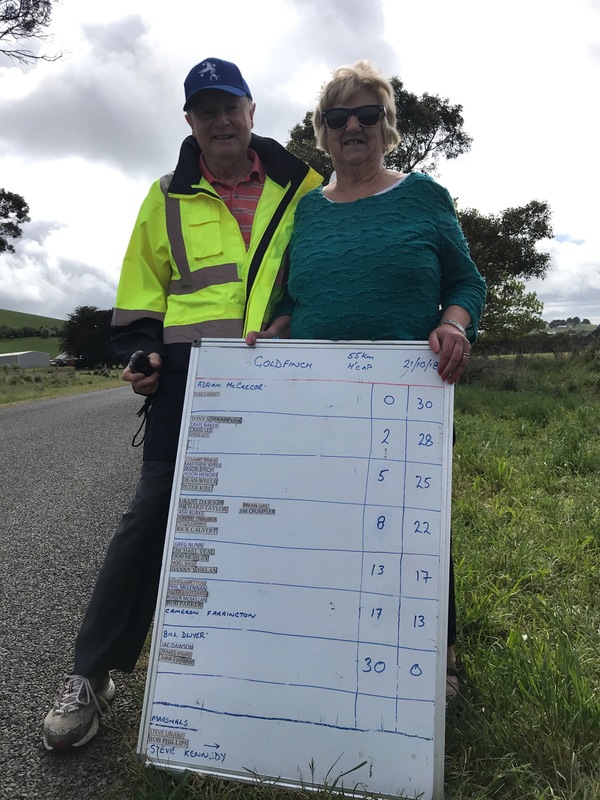 Graeme Parker and Terry Collie conjured some new races for the four riders on that day – a 3 Km handicapped Time Trial and a Points race. Both of those events have now made it onto the Eureka calendar, albeit on longer circuits. 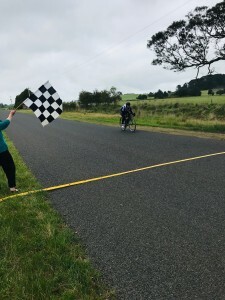 *The Points race format will be used during 2019 when the club introduces kermess racing on a brand new 6.5 kilometre circuit near Learmonth. 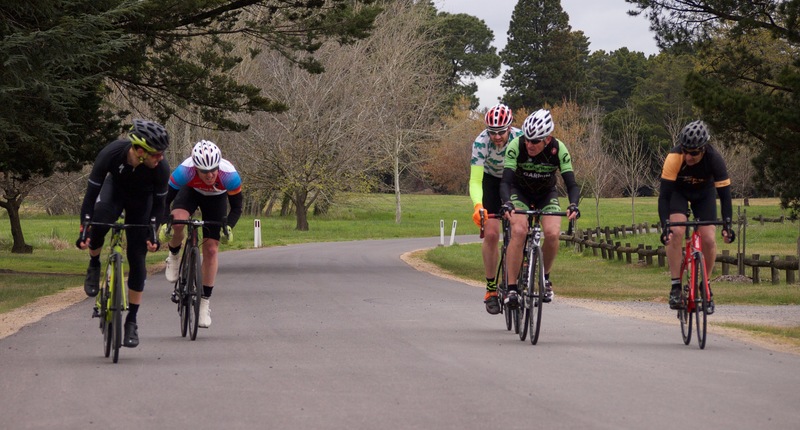 We should also note the riders who were backing up from a tough 85 Km BSCC race the previous day – well done! On today’s menu… three laps of Windmill with points awarded at the end of each lap 4, 3, 2, 1. The rider with the most points in each division wins… Riders, spin your cranks! Graeme Parker went off a bit early to enable his dicky knee time to warm up. Terry Collie and Jacqui Dawson set off at a fair clip but took three quarters of a lap to catch Graeme. At this point it was decided to work on Jacqui’s sprint (no point trying spread each other all over the course) so for the first sprint Terry lead out and Jacqui was able to come off the wheel and hold a small advantage to the line. It was then swap turns to sprint no. 2 and this time Jacqui tried the lead out so Terry waited and came off the wheel late and hard. Graeme was content to keep the knee under control and share the pacemaking. 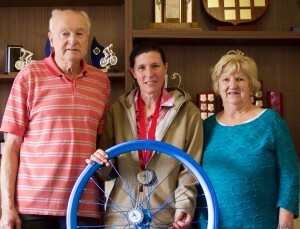 So to the last sprint and Jacqui was again able to use the lead out and come off the wheel for a well deserved win. We have a tough competitor here who just refuses to give up! A mixed field of experience and sprinters fronted the line – James Gretton, Bob Morley, Steve Linane, Danny Whelan, Phil McLennan, Roger McMillan and Peter Livitsanis. Livi was returning from an overseas trip of four weeks. He said he didn’t touch a bike and that he ate and drank too much…so off he went from the line like a flash and the race was on. Livi tested the field on the first hill and it troubled no one. Up Donovan’s and Whelan the Wrecker was on the front in time trial mode. Livi lit up the first sprint and the smooth pedalling Gretton sped to the front. Morley pegged him back but was half a wheel short. Linane held on for third. The second lap was noted for the Whelan attack on the hill. Morley was on his wheel but breakfast was threatening to return. This saw the demise of McMillan – who can sprint – so the field was relieved. McLennan did a huge sacrificial turn on the final straight for the second time. This time Gretton went early and hard and Morley had to work hard to get back on his wheel. Gretton faltered 200 hundred metres out and Morley took off to claim the second sprint. McLennan was gone. Another hit up the hill and Ralph was off the back, the field was down to three. Morley, Whelan and the cagey Linane. Linane went to the front a couple of times but there was no risk of him breaking the cranks. Into the sprint for the last lap and the result was pretty much a forgone conclusion for the overall decision. Linane suggested to Morley that we gift the last lap to Whelan because he had worked hard. Morley dismissed this suggestion (in a kindly manner of course) “You’re having a laugh!”. It was down to the three and funnily enough Whelan was on the front. 600 meters out, Linane cut through the inside and committed. It was a great move as he held off Morley to take the last sprint. Great format, great race. Seven riders, including a few with self imposed handicaps lined up for Division 2. Jeremy Humber and Pete Canny both had jelly legs from the previous day’s BSCC race. Mick Veal was jet lagged having just flown back from his Griswald’s holiday in the USA. Trial rider Paul Tabbitt was out for his first ever road race. Grant Dawson had chosen bike riding over watching Bathurst and Rick Calvert was ready to find some speed for the upcoming trophy races. A fairly steady first lap, with a slight headwind up Coghill’s Creek Road and some pushes on the hills. The lack of attacks ended in a bunch sprint with Crumpler and then Veal over the line. 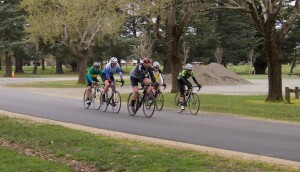 The second lap was a little smarter, with Veal yelling group strategy (in reverse logic) to drop Crumpler of the hills. Most had a go attacking on the back hills, but it all came back together fairly quickly. Humber got away on the tailwind leg (Donovan’s Road) towards the lap-2 finish, Crumpler bridged the gap, and both headed to the finish line with Humber launching a well-timed sprint to win lap 2. The third lap got serious with an attack up the quarry hill (Dawson, Canny and Tabbitt) splitting the group into two, finally coming together again at the church corner (Addington Rd/Coghill’s Creek Rd). The attacks were on on the last hill, with Calvert and Canny making breaks. The final long break from Canny got him to the finish line first, with Crumpler chasing and Tabbitt in 3rd. 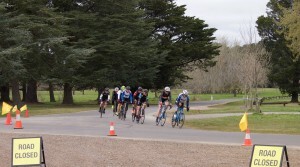 Off to a flying start, Division 1 tore around the Windmill circuit on the first lap and averaged 39 Kph. It seemed that the unspoken plan was to set a high enough pace to deter anyone from making a long range attack for points. As mentioned, the first lap got off to a flyer and the riders never relented. Smith tried an attack down Addington Road which was quickly covered by Ellis and Kiel. Ellis was able to get off the front in Donovan’s Road and Brien joined him. The others gradually reeled them in and the riders were all accounted for as they crested the final rise before the run to the finish line. Lee and Smith went early. The wiser heads knew that the fastest sprinter was Ayres and they queued up on his wheel as he towed them back to Smith and Lee. Ayres went and Wells followed with Schiemer putting a gap to the rest. Lee didn’t ease off as they started the second lap. Whilst others were gasping, he was driving ahead. Phillips had been lost to the bunch already. Riders scrambled and eventually caught Lee, however Ayres was struggling and would soon be unhooked. Up the quarry hill and Ellis was keeping a high pace. Into the headwind along Coghill’s Creek Road and when Wells noticed Ayres off the back he encouraged everyone to keep driving. Ellis obliged. Eventually the others joined in and Ayres was out of the running. Down Addington Road again and Schiemer had a rapid air deflation episode which saw him out of the race. Into Donovan’s Road and Ellis resumed the lead and just kept ploughing on. The others were more than happy to let him do a 4 kilometre lead out. Wells was on his wheel and as they neared the finish line Smith was the first to hit out. Wells and Lee found his wheel before Lee exploded away to take the sprint. Tight for second and plenty of space between the other riders. Ellis rolled back through to the front and kept driving the race as they passed the quarry. His glances over his shoulder were more than enough to suggest that he had finally warmed up and was ready to dish out some hurt. Up the hill and he opened a small gap, into Coghill’s Creek Road and he was away. Passing through Blowhard and Smith rallied the remaining troops to start the chase. Five riders chasing one and “the one” was pulling away. The status quo remained until the race turned into Donovan’s Road for the third and final time. Up the rise and Smith applied some more power. Kiel was there to cover the move, however lungs were hurting everywhere. Smith got a few metres off the front of the chase group – he had Ellis in his sights. Lee jumped across and the two started working to ensure Wells couldn’t follow. He couldn’t and they pulled away all the while closing in on Ellis. The pair eventually collared Ellis inside the last kilometre, but oh had they been made to earn the catch! Down to the line and screaming legs could barely muster anything approaching the speeds of the earlier sprint. Nonetheless, Lee took the major points and the overall race win. The field was spread over an even greater distance. Smith rounded out his morning by donating his prize money back to the club. Raffle tickets were purchased in his name and he duly won the $50 Ballan Local Butcher meat tray! This race split apart so quickly that most onlookers thought there was a fourth division on the circuit. Michael Lynch and Terry Collie quickly opened a gap, however it was off the tail of the race. They enjoyed a pleasant amble through the park before Collie somehow finished in third place. The action ahead saw old hands Phil McLennan, Roger McMillan mixing it with trial rider Cameron Farrington. Each had a go on the front of the pack. However the occasional attack was not ferocious enough to split the trio. Farrington took off with two laps to go and likely blew any chance of collecting a maiden victory. McMillan and McLennan marked each other whilst Farrington opened a sizeable gap. Bell lap and the catch was imminent. The Maccas flew into the lead and had a ding dong battle down the straight with McMillan taking the win. Division two fielded the largest number of entrants, with nine riders taking to the start line. Such large numbers meant there would be plenty of opportunity to just sit on and let others do the heavy work, however that did not really eventuate. Steve Linane had earned himself an upgrade after recent heroics in the minor league. Peter Gunston had wangled a demotion. Matt Ayres escaped the Handicapper’s notice again and was ready to battle Jeremy Humber and Brian Ure in a sprint finish. Dan Crook was back after a winter hibernation, whilst Ralph Jones is still in hibernation mode. Rounding out the field was new rider Ben Davies and trial rider Paul Tabbitt. Ding! Away they went in what can best be described as a “fair affair”, with many contributing to the pace. A few faster efforts were not able to shake anyone completely off the back of the peloton, although there was some chasing to hold wheels. Crook spent a lot of the early race near the rear before trying to break away mid race in a Bowmanesque move, which unfortunately did not yield the gap he hoped for. James Gretton got away with less than 15 minutes remaining. The peloton allowed him to ride off the front, however when the gap got to 150 metres the peloton started working harder and reeled him back in. The race was always destined to end in a field sprint with the likes of Humber, Gunston, Ure and Ayres strong enough to neutralise any threats – it did indeed end that way. The sprint started from before the final turn as the riders spread wide across the road chasing Ayres who led from the front. In sight of the finish line and Ayres still held the lead with challenges coming from Gunston and Ure, but the man on the new steed sealed the victory. Just five riders in Division 1 with plenty of stop/go antics. Reigning Club Criterium Champion – Craig Lee – dictated the race from the start. Tony Mirabella, Greg Ley, Jason Hendry and Rob Phillips made up the field and for the most part were forced to play the game on Lee’s terms. Easy, easy, then attack. Regroup. Easy, easy, then attack. Regroup. Lee looked for chinks in his opponents armour and he found them. Phillips was struggling with the surges and was eventually dropped. Hendry made sure he wasn’t dropped. He was confident in going head to head with Lee in a sprint. Ley was often on the front trying to hold a high enough pace to deter others from attacking. Mirabella had some doubts about his stamina, so in his typical style attacked. That effort saw him off the front for a few laps, however the three chasers worked hard and brought him back. The next few laps were at grandma pace and Phillips was able to finally catch them after his long, long chase. Riders eyeballed each other as the two lap call was received. This late in the race, no-one was prepared to launch from too far out. Bell lap and the non sprinters were getting edgy. Heading towards the end of the pony club straight and Ley made his move. He quickly opened a six length gap as the others all waited for their moment. Round the final bend and Ley still held his lead however the others were ramping up and closing swiftly. Hendry hit out first and looked home, however Lee had sighted the chequered flag and exploded in the last 100 metres to win easily.